It’s that time of year and Oprah’s been busy curating a collection of new and wonderful products that make great gifts for the holidays. They span several categories but we’re going to focus on the cook or chef on your gift list. Oprah’s Favorite Things for the chef 2017 were handpicked for their quality and usefulness and they range in price from well under $50 to well over $100, so there’s something for everyone’s budget here. Some gifts are for those who love gadgets in the kitchen, while others are for those who love ingredients to cook with. If Oprah loves it, the gift recipient will probably love it too, so let’s start with the least expensive products and work our way up. All of them are available on Amazon, as are the products from other categories, so shopping for all your friends and family in one go is pretty easy! Want to see what else Oprah chose? Many of the products that she chose last year are still available to buy. Cooking and garnishing with fresh herbs is a delight, as not only are they healthy to eat but they brighten up a dish with their fresh flavors and aromas. But if you buy bunches of herbs from a store, they can’t be used up in one go and will immediately start to brown and wilt. That’s why the Honey-Can-Do Glass Herb Preserver is a handy tool for any cook to have in their kitchen. This tool will keep herbs fresh for up to two weeks when stored in it and placed in the refrigerator. It is made of a clear glass container so that you can see through the sides and identify which herbs are in there without opening it up each time. The top lid has air vents to allow the herbs to breathe and can be lifted to fill the container with herbs and a little water. A spindle with its own knob on top runs through the lid and connects to a perforated tray in the bottom, which you pull up to lift all the herbs out of the container while leaving the water behind in the container. The Honey-Can-Do Herb Preserver is sized perfectly to fit in most fridge doors. If the gift recipient likes to kick up the spice levels a bit when cooking or garnishing their dishes, they’ll probably be excited to try out some new hot sauces. The ‘The Good Hurt Fuego’ Hot Sauce Sampler Set by Thoughtfully features 7 different hot sauces that range in spiciness from mild to blazing hot and each has its own delicious flavor profile. It includes the legendary Ghost Pepper that will make even the most ardent hot sauce lover sweat, and a very mild Garlic Herb that anyone can try. In between these are a Hot Garlic Pepper, a Chipotle Pepper, a Smokey Bourbon, a Cayenne Pepper and a Whiskey Habanero. Each sauce comes in a 3 ounce bottle, and together they’re wrapped in a bundle made to look like dynamite before being packed in a gift box. This would make a great gift for barbecue lovers too! Having a cheese platter as part of the hors d’oeuvres or dessert course at a party is easy to do, but you have to treat the cheeses delicately or the soft ones will look like sad and out of shape lumps while the hard cheeses will crumble into bits. However, with the W & P Design The Cheese Knife a host can confidently present a beautifully prepared cheese board to her guests everytime. There is no need to use multiple knives for different cheeses. This one is designed to not only slice cheese, but to spread or spear it, depending on the texture and usage. Its stainless steel blade is sharp enough to cleanly slice through firm cheese, while the tip can break and spear the very hard aged cheeses. The full tang handle is made of polished hardwood. The total length is 7 inches. To get the recipient started, you could pair this gift with a wedge of gourmet cheese. Do you know someone who’s on a diet or is just trying to eat healthy? They probably have eliminated most desserts because of the sugar and fats. But what if they have a machine that turns frozen fruit into a frozen dessert that’s very similar to ice cream texture? The Gourmia GSI180 Automatic Healthy Frozen Dessert Maker does just that. It is also a good gift for those trying to get their fussy kids to eat more fruits. It just needs to be fed ripe fruit that has been frozen a few hours directly via the top tray and out comes delicious but healthy soft-serve sorbet in a matter of seconds. Whether you’re using bananas for a creamier taste or pineapples for a slushy drink, This machine can be used for daily use or for a pool party. You can try out several different recipes from the included recipe book by mixing and matching fruits, adding chocolate sauce or nuts or using the frozen treat as filling for pies. Oprah does seem to love frozen desserts! Last year she chose the Yonanas Dessert Maker among other things. Good maple syrup is delightful for pouring over pancakes and waffles, but it’s also great as a dessert topping and for cooking and baking. Mount Mansfield Maple Products Organic Pure Vermont Maple Syrup is a top quality Grade A product with a rich amber hue and as pure as can be. It comes from a 5 generations family owned maple tree farm in Vermont and the maple syrup is certified 100% organic. The 1 litre bottle is pretty enough as it is but it you want to step it up a notch, you can choose to package it in their lovely wooden gift box. If you want just one weighing scale and bowl to measure evrything under the sun then the Taylor Weighing Bowl Digital Kitchen Scale is a good choice. You can use the very good looking stainless steel bowl to measure things like flour and milk or you can place things like vegetables directly on the scale. And yes, unlike most other kitchen scales, this one does let you measure liquids too in fluid ounces and millilitres. When measuring solids, you can select from pounds and ounces or kilograms and grams. The maximum amount of dry weight you can measure at a time in the 8 cup bowl is 11 lbs or 5 kgs. The tare functions lets you zero out weights so you don’t have to keep track of and subtract the weight of anything already in the bowl. Just add one ingredient, press tare and add another ingredient. The scale will reset to zero in between. No need to uses multiple bowls that need washing up. This scale is also very accurate. When weighing dry or liquid ingredients, you can get precise 0.1 oz or 0.1 fl.oz accuracy, while in metric measurements, the accuracy is to 1 gram for dry ingredients and 1 ml for wet. The scale will auto shut off after a few minutes to conserve the 2 AAA batteries but you can shut it off yourself too by pressing and holding the tare button. The bowl has a lip designed to pour without spilling and it is large enough that you can directly mix ingredients in it after measuring. Just use a hand mixer or immersion blender. Once done, the bowl can flip over the scale for compact storage. We have also reviewed a few other kitchen scales that are rated well for accuracy. A vinegar and olive oil bottle on the dinner table adds a nice touch to a meal or dinner party, especially if the pair creates a wow factor, like the Ichendorf Tonda and Rings Cruet Set does. As it is, glass bottles allow the brilliant color of the condiments to come through, but this set is made of really beautiful hand blown Italian glass and designed to add flair to any dining table. The spouts are removable so you can fill each bottle without spilling and cleaning is easier too. If the host likes cooking Asian meals instead of Italian, she can use these bottles for soy sauce and chilli oil instead. Whatever her preference, try to fill them up first with good brands of condiments before gifting. An entertainer will always need a few serving trays handy and the Beatriz Ball Alegria Serving Tray is a particularly beautiful one made of food safe melamine that looks like ceramic. It can be used to carry dishes or bar items, or used as a platter to place dry foods like cheese and hors d’oeuvres directly on it. The handles of the tray are built in and the pearl-like edges make it extra pretty. This durable platter is dishwasher safe and break resistant. It is available in a few different colors and you can buy this as a single item, or buy some or all of the other items in the coordinated set, or mix and match with other colors in the same collection to make a more festive set. If the recipient usually prefers more rustic table decor, then this Montes Doggett Server Tray S may be more to their liking. This 30 x 9.5 inch server comes with a handle on one end and can be hung for storage. 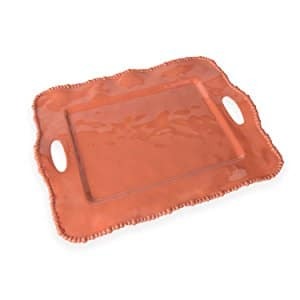 The tray is easy to clean by hand with soap and warm water and is perfect for serving crackers, cheese, fruit and appetizers. Everyone can get cultivated blueberries anywhere, but wild organic ones are rare. This 5 pound box of Wild Organic Blueberries from Josh Pond comes from the coast of Maine and is frozen within 24 hours of being picked. Instead of being picked mechanically, these blueberries are raked by hand early in the morning to minimize bruising when they’re still cold. What’s special about wild blueberries is that they’re higher is nutritional value, are 50% less sweet and are twice as rich in antioxidants. Because they’re not pumped up with water, they’re smaller, firmer and more flavorful. The box is shipped overnight in dry ice and arrives frozen. A panini maker is quite an underrated kitchen appliance but it shouldn’t be because it can get an entire family out the door in the morning with a good homemade packed lunch that doesn’t take much time to make. The Breville BSG600BSS Panini Press takes it one step further because with it you get perfectly crisp toast on the outside while the inside remains fluffy. This is because its Innovative Crush Control hinge gently presses the top plate down on the sandwich with exactly the right amount of pressure so as not to crush and flatten the slices. You can also adjust the top plate to stop at a suitable height depending on the thickness of the sandwich. This panini press is also capable of toasting croissants, quesadillas and wraps and also lets you do an open melt in the open position. You can get two sandwiches in at the same time and it takes 2-3 minutes for a nice even browning. The PFOA nonstick finish on the flat cast-aluminum plates makes for very easy cleaning and it doesn’t take up much counterspace at all. It can even be stored vertically in a cabinet. This panini press does not have removable plates, so if you want a model that comes with multiple sets of plates to switch from sandwiches to grilled veggies or meat to waffles, then take a look at these panini makers with removable plates. If someone loves to make and eat pizza but has to settle for an electric oven made one, then the unique BakerStone Original Pizza Oven Box Kit can get them a step up to making pizzas that come close to wood fired ones. The way the BakerStone Box works is you place your pizza in the box and place the box on top of a 3 burner stove or large gas or charcoal or pellet grill and the heat is magnified inside the box through radiation, convection and conduction. The effect turns the box into a pizza oven and cooks the pizza in about 4 minutes. It can also roast vegetables and meats and bake bread. The heat chamber is made of cordierite stone with an enameled steel housing and the conduction of heat and circulation of air from the stove or grill underneath is what provides the quick and even cooking that you would normally only get in a wood fired oven. An electric toaster oven is great for toasting, baking and grilling, and an air fryer is great for crisping foods without using much oil. The Cuisinart TOA-60 Convection Toaster Oven Air Fryer combines the two functions into a single appliance to save kitchen space. Rated at a powerful 1800 Watts and providing the cook with 7 different functions, it provides tremendous value to any kitchen set up. Select from the following functions: Convection Bake, Convection Broil, Bake, Broil, Warm, Toast and Air Fry. The difference between the regular and convection bake and broil settings is that the latter uses a fan to circulate the hot air inside for more even cooking. You can fry chicken wings and make donuts in the same appliance! The 0.6 cu.ft. oven/air fryer features a non-stick interior and can hold 6 slices of bread or 4 bagel slices for toasting, a 12-inch pizza for baking, or a 4 lb chicken or 1.5 lb tenderloin for roasting. If you want to air fry that chicken, all you need is a teaspoon of oil. When toasting, there’s a shade selector-timer that you can set to get your ideal amount of browning on your toast. There’s also a light inside for you to check on whatever’s cooking. An adjustable 60 minute timer and thermostat auto shuts off heating when done. The appliance comes with a baking pan, oven rack and air fryer basket. Of course, if you don’t want to combine these cooking methods in one appliance we also have reviewed good toaster ovens and air fryers separately. A nice looking set of utensils in the kitchen can lift the decor instantly and copper finished ones do just that. Enter the beautiful hammered copper Fleischer & Wolf Seville Series Cookware Set. The set includes a 8″ and 9.5″ frying pan, a 1QT, 2QT and 3QT sauce pan, and a 5.75QT dutch oven. All of them come with stainless steel covers to make up 10 pieces in total. The actual utensil bodies are made of 3 layers that are 2.3mm thick and comprised of copper on the outside for better heat control and retention, an aluminum middle layer for even and efficient heat distribution, and the innermost stainless steel for safe cooking. The handles on all are strong and made of stainless steel. All the pieces are oven and grill-safe so you can start a dish on the stove and transfer it to the over or grill to finish. For the utmost versatility in processing of foods to make a variety of dishes and drinks, a gift of the newest Ninja appliance is a good bet. The Ninja CT682SP Intelli-Sense Kitchen System with Auto-Spiralizer comes with 4 different BPA-free and dishwasher safe attachments and 12 Smart programs that the chef can select from by just tapping on the touchscreen panel of the base. For those who like complete control, they can instead select speed and power manually and run the machine for different amounts of time. Depending on the attachment that you use, the base automatically detects which one it is and only displays the programs that can be used on that one. You get the following very durable attachments: a 72 oz. Total Crushing Pitcher for frozen drinks, a 24 oz. Single-Serve Blender Cup to make and transport your smoothie, an 8-cup Precision Processor Bowl for chopping and processing foods, and an Auto-Spiralizer to turn fruits and vegetables into healthy noodles. A handy inspiration guide provides 35 easy recipes and you can make everything from pizza dough and salsa to ice cream and margaritas. The base of the unit is also easy to clean because of the flat touchscreen panel. Just wipe with a damp cloth. Anyone that spends a lot of time in the kitchen needs a good set of knives that are sharp and ergonomic so that they can do their prep work fast and comfortably. The Cangshan N1 Series 6-Piece German Steel Forged Knife Block Set is sure to please such a cook. There are 5 knives in this set: a 8-inch chef’s knife, a 7-inch Santoku knife, an 8-inch bread knife, a 5-inch serrated utility knife, and a 3.5-inch paring knife. Rounding out the set is a beautifully hand crafted Acacia wood knife block with its own unique grain and approved by the National Sanitation Foundation. These unique knifes are completely made of metal. Yes, even the patent pending ergonomic handles! That means there are no screws or rivets that eventually get loose and cause the handles on other knives to become loose over time. Each knife is well balanced and feels easy on the wrist. The German steel blades are precision calibrated for hardness. This gift is for a real coffee connoisseur who is serious about his caffeine fix but wants to get it at home quickly and with minimal clean up. The Breville Nespresso Creatista Plus can make Espresso, Lungo, Capuccino, Latte, Ristretto, Flat White & Latte Maccchiato at 19 bars of pressure and gives you either a pre-programmed volume or can be customized to your cup size. A pop-out shelf lets you use a smaller cup if desired. The quality of brew is impressive every time. The milk will be perfectly frothy without you needing to intervene after you set your desired beverage from the menu, the temperature and texture of the milk. There are 11 temperature settings and 8 milk foam settings. The steam wand automatically senses the milk’s temperature and adjusts the steaming accordingly. It can be used to steam plain milk as well and has an auto purge feature for easy cleaning. The coffee maker takes just 3 seconds to heat up and can go into power saving mode until it shuts off on its own after 10 minutes. The capsule container can hold up to 10 capsules at a time. The 1.5L water tank is removable so that it’s easy to refill at the kitchen tap. Cleaning is easy with the step-by-step instructions displayed on the interface. The machine includes a welcome set with 16 Grand Cru capsules to get the recipient started. The first generation Nespresso capsules are recyclable.